Volunteers dish out crab legs, corn-on-the-cob and more during Crabfest, hosted by Craig Chamber of Commerce. The annual event takes place Saturday at the Moffat County Fairgrounds Pavilion. — A dinner of king crab legs begins at 7 p.m. and includes a comedy hypnotist, commemorative photos, live and silent auctions and more. Tickets are $50 and are going fast. For more information, call 970-824-5689. It’s that time of year to get cracking. 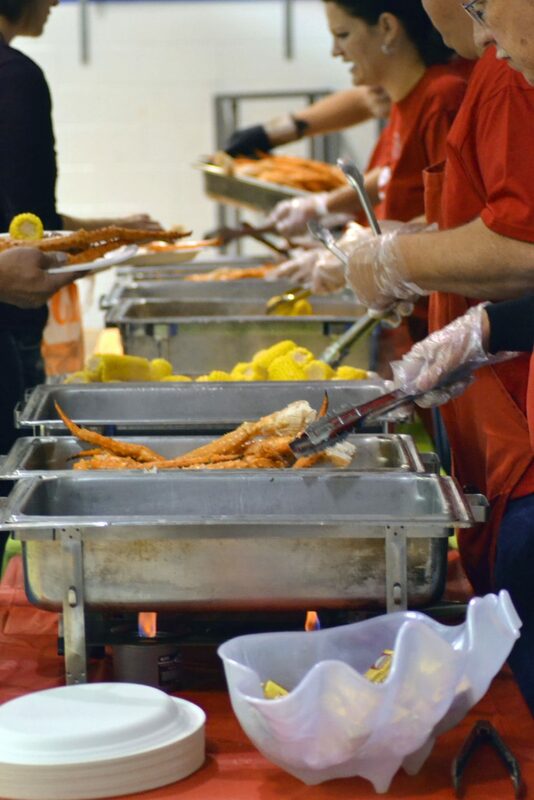 Crabfest 2014, an annual extravaganza of delicious seafood hosted by Craig Chamber of Commerce, will take place Saturday evening at the Moffat County Fairgrounds Pavilion. Doors open at 6 p.m. and the meal starts at 7 p.m., with 300 pounds of king crab legs available for those in attendance. Red potatoes, herb and cheese biscuits, corn-on-the-cob and more are also on the menu, which will leave people simply stuffed. “No one’s going to leave hungry,” said Chamber Executive Director Christina Oxley. Delectable drinks will be in stock for those of age, while entertainment for everyone can be found with souvenir pictures from Quality Plus One Hour Photo and a performance by comedy hypnotist Rusty Z, who last visited Crabfest in 2011. Live and silent auctions will also take place to round out the night of fun. Tickets are $50 and are in short supply as the event nears. Admission must be purchased in advance, and attendees must have tickets ready at the door.